Kaci Hemby on Remember to vote! You’ve heard the argument for and against Blair Park. You’ve seen the mailers, seen the lawn signs. But lost in the shuffle is Coaches Field. This field is the only 60 & 70 foot baseball diamond in Piedmont. Thanks to the efforts of the Piedmont Baseball Softball Foundation (PBSF) and the Piedmont Recreation department, the field is now one of the best in it’s class. It’s nicer than fields in Orinda and Moraga and a jewel for baseball and softball in Piedmont. This abomination has been suggested. 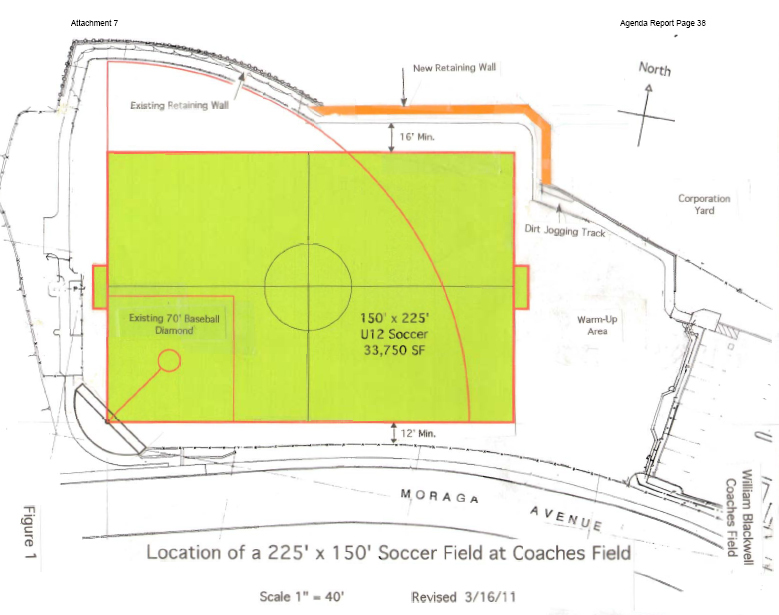 But the controversy around Blair Park has led some ill-informed and short-sited individuals to suggest paving over the beautiful baseball field with a plastic soccer field. Somehow this is considered “the lesser of two evils.” I strongly disagree and hope that you do too. The baseball and softball programs should not be sacrificed in the name of 24/7/365 soccer. The field at Coaches was clearly designed as a baseball/softball field, with soccer as a secondary use. There are already U10 soccer games and practices there. To sacrifice baseball and softball for soccer is not appropriate. This is the only baseball field that can accomodate our 10-13 year olds. The city only has two baseball fields: Hampton and Coaches. Hampton is used by the 7-10 year olds and Coaches by the next group. Our older Pony players (13-14yr olds) use the Witter Baseball field for games, which is a school district property, but they also practice at Coaches. Coaches field is also used for adult and youth softball. To lose this wonderful field to a plastic grass soccer field would be a shame to Piedmont and a disservice to the youth baseball and softball programs. Whatever your feelings about Blair Park, I ask that you sign the PBSF petition for lighting at Coaches Field, then write to the city council asking them to retain the natural baseball field surface of grass and dirt. Show up at the Piedmont City Council Meeting, 7:30 pm on March 21st, to support both lights at Coaches and no paving over the baseball field. Send an email to the Piedmont City Council to let them know that lighting coaches is a well-needed project and an appropriate use of a city park and that covering the baseball diamond with plastic is not acceptable. Piedmont Baseball Softball Foundation (PBSF) is asking for you to support the lights on Coaches Field. I am very involved with the program as a softball and baseball coach and a board member. In the context of Blair Park and the issues around the proposed development and opposition to that development, I feel that the project to add lights at Coaches has been overshadowed. Adding lights is a relatively easy, minimally impactful way to improve our very limited baseball and softball resources in Piedmont. The PBSF announcement about their campaign for support of the lights is below. Whatever your position on Blair Park, I ask that you consider the benefits for adding lights to Coaches Field. We Need Your Support Now for Lights at Coaches Field! You’ve already heard about PBSF’s commitment to ensuring that the Blair Park Sports Fields project is approved by the City Council. We’re working with many other youth sports organizations and community leaders on this effort and we’re hopeful that Blair Park will become a reality in the near future. However, Blair Park is only part of the solution when it comes to addressing the shortage of usable field space for our local youth baseball and softball players. We’re writing today to ask for your assistance in supporting the other half of the solution-field lighting at Coaches Field. This issue is on the agenda for the March 21, 2011 Piedmont City Council meeting along with Blair Park and it’s very important for baseball and softball supporters to make their voices heard both in advance of the meeting as well as during public testimony. I’m not talking about the World Series here, but Piedmont’s hometown youth baseball program, PBF. Priority registration for Piedmont residents and PUSD-students for our Spring 2010 Baseball Season is underway now, and closes on November 6th. Residents and PUSD students should register now to secure a spot. If any division nears capacity, waitlisting will automatically begin, even for residents and PUSD-students. Please revie w important dates and instructions below before registering. We encourage all families to register early in the proper registration window to improve your chances of securing a spot. To register, go to www.piedmontbaseball.org and follow links to Register. Piedmont residency or enrollment in a PUSD school is required. Residents are strongly encouraged to register and pay fees during this window to secure spots. Spots fill on a first-come, first served basis. Waitlisting will occur when enrollment in any age group approaches capacity. Non-resident, non-PUSD registrations received during this time will be canceled by our registrar, and a $25 fee will be assessed. Piedmont Charging Youth Sports for Field Use? There have been some rumblings at the City Council about possibly charging local youth sports for field space usage. What do you think of that idea? 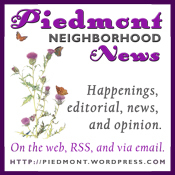 If fees are charged, should Piedmont-based programs get a resident rate and priority since participants (or their parents) pay Piedmont property taxes, or is it “first-pay, first-served”? Piedmont Soccer Club, Piedmont Girls Softball, and Piedmont Baseball Foundation are all non-profit 501(c)(3) organizations. Should they be charged the same as private use? Leave a comment to let us know what you think. You can also click “Your Local Officials” above to contact the council directly. Piedmont residents have priority registration for the Piedmont Baseball Foundation’s spring’s season until November 9th. Residents must register during this window to be given priority on open spots. Waitlisting will occur when any program approaches capacity. If you are interested, please take advantage of this opportunity. After the 9th, open registration begins. For more details, visit the PBF website.